In fact, he guaranteed it to us. You should probably hear him out. Experts call him “Australia’s greatest racing analyst”. Step back with me a few months ago to May this year. A member of our team, Alan Jacobs, had just made an big boast … that he had a winning approach which relied upon one form factor that he said identified over 60% of all winners. He said his secret winning horse racing approach was ready for release. Of course, there was one condition … he demanded that we disclose to you the main form factor behind his approach, FOR FREE, so that you could decide if this brilliant technique was for you. To give you an insight into the brilliant technique that has made PACE ACE, hands down, our premier racing method release this year. But before we peel the onion on this million-dollar mystery, we had some conditions of our own. You see, we’d never consider sharing this story with you until we could confirm his claims. Can this gentleman back it up? And if he can back it up, how? We set him his task. To return a profit going back to January 2013… over three and a half years of horse racing data. We insisted that we apply his betting approach to Saturday, Metropolitan racing in both Sydney and Melbourne, looking at over 73,800 individual horses, to test his claim. We set him his task. To return a profit going back to the beginning of 2013, and that it had to have a win strike rate which would be great enough to beat the recognised favourite strike rate of 33%. 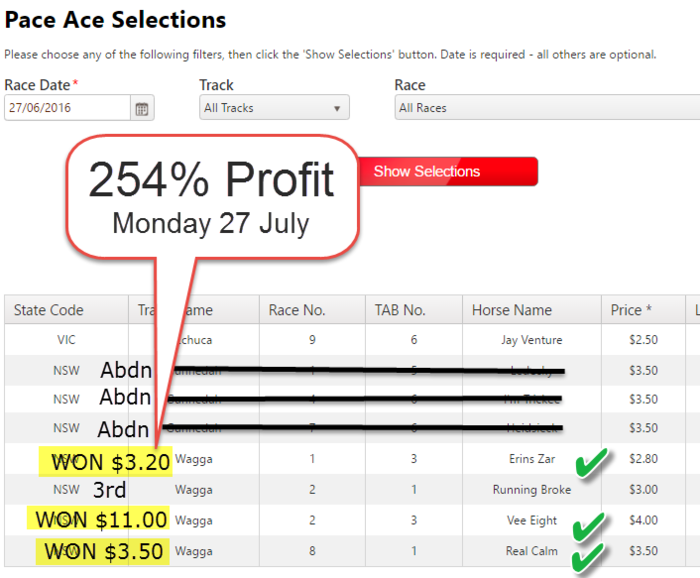 Alan, accepted the challenge, boldly guaranteed it to us and duly returned a winning profit and a win strike rate of 37%. One of the indisputable facts about horse-racing is that on-pace horses (those runners positioned from 1st to 4th in the early stages of a race) win a high percentage of all races. In fact, they are true ‘crunch’ horses, usually highly dependable, especially when well-supported in the betting. . In contrast, horses that race back in the field win very few races with their ‘get back and finish fast’ pattern. It makes sense, then, for punters to pay greater attention to the on-pacers than the backmarkers. On-pace runners usually miss trouble in the running; they don’t get caught wide, they don’t get bottled-up in the pack, they can dictate their own terms to a great degree and they are usually positioned well enough on the home turn to have every chance of winning or running a placing. PACE ACE’S handicapping approach is designed to ‘cash in’ on these on-pace runners. It’s a handicapping approach that seeks out those horses who are VERY LIKELY to figure in the money and who will win an above-average share of races when shown to be well-supported in the betting market. Research that Practical Punting magazine did some years back proved conclusively the power of the on-pace horses. It showed that 61.5 per cent of all winners are positioned 1st to 4th at the 400m, while a mere 8.6 per cent of winners are placed 9th or worse - compelling statistics. Who amongst you can honestly state that they bet backmarkers with any confidence? Analysis of the in-running positions and varying track conditions (fast/good, dead, slow and heavy) shows that irrespective of the number of starters in a race, the distance of the race or the track conditions, on-pacers have at least four times more chance of winning than backmarkers! These are compelling statistics for any punter to consider. Long-term, the percentages favour the on-pace horses. They are going to win a high percentage of races. 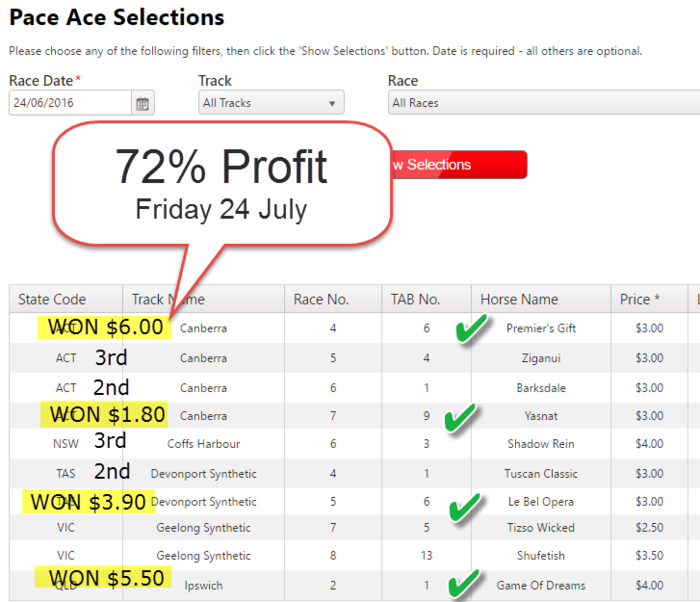 So with this information, how can we adapt the on-pacers factor to produce winning outcomes for punters? The answer is that we keep it simple. To know how to put our money on a horse with a tip-top chance we merely concentrate on each horse’s latest start. This is the start that usually provides the best guide to future winners. We cannot release the precise rules here, as they are for members only, but we certainly will give you the full logic behind this handicapping approach. We want our horse to be fit and to have had recent racing. Secondly, we require a horse to have good form. And that is the PACE ACE approach. Very easily understood and highly effective. You will find that these bettable runners are terrific propositions. The strike rate for the place (1st, 2nd,. 3rd) is very high. The win strike is excellent. For the purposes of the PACE ACE approach, though, we are concentrating on our fancied qualifiers. Alan Jacobs, one of our very best racing experts that researched and developed PACE ACE, has authorised a limited release of his rules and results. He has had such great success with this winning method, understandably he doesn't want to suffer from ‘over-exposure’ of the rules. It has been mutually agreed, therefore, that a limited distribution of PACE ACE will be made to our Practical Punting members only. But first make sure you study the features below, see how simple it is and how profitable it has been over the past three and a half years, then when you have decided that this approach may be for you – simply click the order button and get instant access to the full rules and results and get a the 12 month selection service where we do all the work for you. But let us repeat – there is a limited membership. Alan Jacob's aim was to win consistently. That is exactly what he have achieved over the massive past 3.5 years of research. The win strike rate was a superb 37%. Not only has this system been research over three years - it has been proven to us in practice over the last eight months of monitoring. Remember ... the vial form factor that PACE ACE is based upon is one that that 60% of all winners share! On-pacers keep winning, while backmarkers find it a never-ending struggle. This is where the astute punter should be focused. Combine the analytical power of the professional racing analyst Alan Jacobs with the power of our research databse - check back the past results, and you have the combination for a magnificent racing method, and that is exactly what PACE ACE has proven to be. Research data has monitored over 70,000 horses, approaching 10,000 races over the last three and a half years - that is comprehensive! 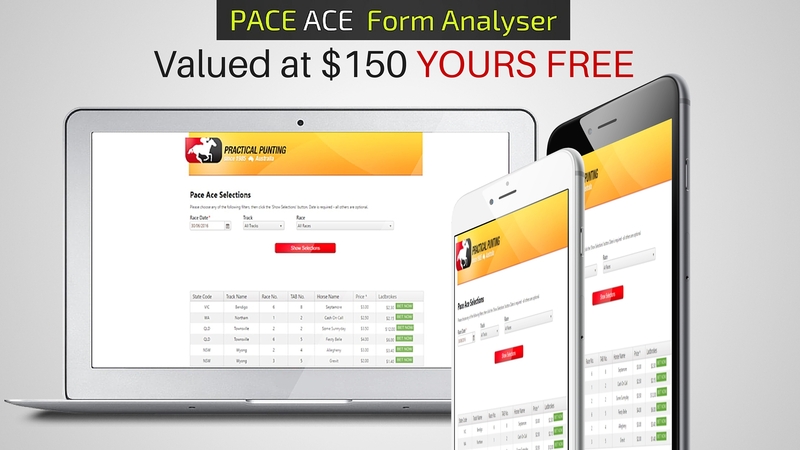 When you join the PACE ACE service you get FREE access to an online interactive selection facility, called the PACE ACE Form Analyser, where the PACE ACE formula has been programmed, allowing you to apply the rules and generate the selections. Just select the race, at any TAB Australian gallops meeting and up pop any PACE ACE selections. Starting today, a subscription to PACE ACE is less than $3.50 a week. That’s small potatoes considering the amount of time you will save and the possible winners you can identify by applying the PACE ACE Form Analyser when and where you like. For PACE ACE betting approach to give you its all, it needs to be applied by those that have both the time and the analytical skill. Well, now we have solved this problem. 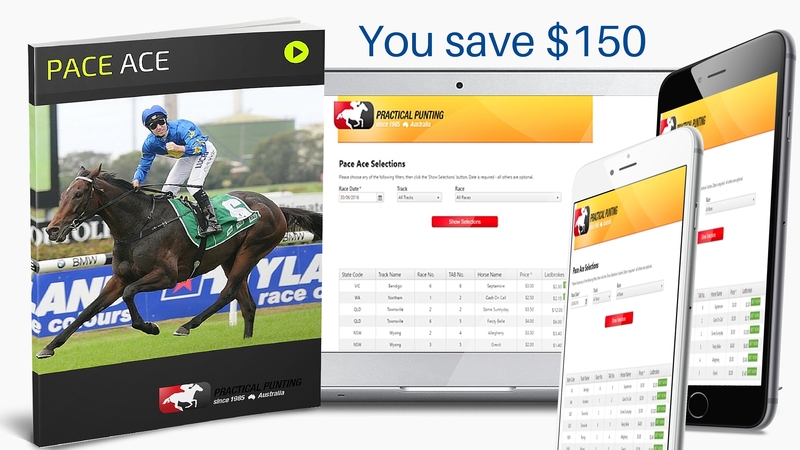 Now you can get the top selections for all TAB Australian gallops meetings, betting when and where you like, without barely lifting a finger - thanks to the PACE ACE Form Analyser. Even a novice punter can read these rules and understand the fundamental brilliance of this formula. But in doing so you will understand the massive ‘caveat’ ... the essential problem … that tails the brilliance of the approach. That is, its application to all TAB Australian gallops meetings is a mammoth task. This is where the PACE ACE Form Analyser provides the ultimate solution .. it does all the work for you. You’ve been carefully selected from Practical Punting’s wider community … as I believe members like you will have an interest in this unique opportunity. So how does the aproach work in practice? Let's look at a few recent results, in the days immediatley before our launch on 4 July 2016, to give you an example. The key point about the PACE ACE approach is that it will always be looking to provide you with a set of superb prospects. A high percentage will be placed in the first three home. A good percentage will win! What You Get . . . Exclusive access to the PACE ACE member’s online tipping service. 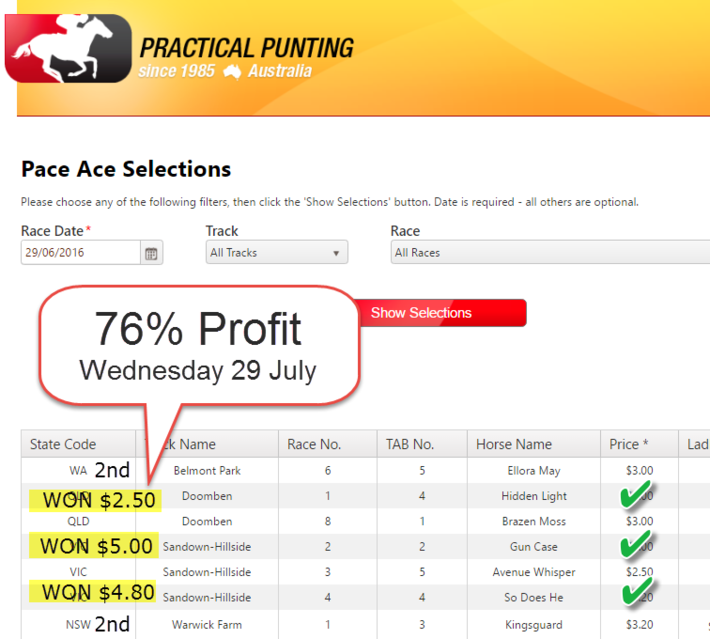 Yes a dedicated private online tipping area for PACE ACE members, where Practical Punting’s team of analysts will show you the ‘ins and outs’ of the brilliant selection formula. They will apply the PACE ACE selection formula to every race at every major metropolitan Saturday meeting in Sydney and Melbourne and provide you with those Saturday selections. When you join the PACE ACE you now get FREE access to an online interactive selection facility, called the PACE ACE Form Analyser, where the formula to the selection method has been programmed, allowing you to apply the rules and generate the selections. Just select the race date, state and track and up pop your selections. Most important, I urge you to click the “Start Now” button because there will never be a better or easier time to position yourself for the opportunities ahead. All for less than $3.50 a week – one of our lowest subscription rates, for such a great service.